In the lane behind my house, I found a letter. I looked around for who might have dropped it. The neighbours behind me, across the lane, have a 5 year old daughter and another one on the way. The letter must have been hers, but where had she run away to? 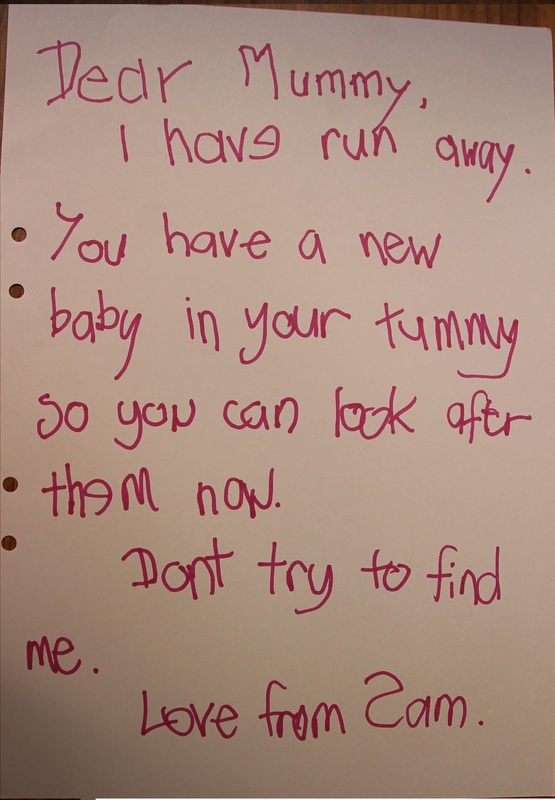 As I held the letter, feeling my heart break because this little girl thought her mummy didn’t have enough room in her heart for her anymore, I heard a small voice, singing a little song. When I came to the gate of my neighbours house, and looked through the little hole where the latch is, I saw the little girl hiding behind the shed. She had her teddy, a banana and a picture book that she was looking at. “Oh, hi Tom! I’ve run away,” she replied, grinning proudly. “I left that for mummy on the outside table. How did you get it?” she asked, frowning. “You know that your mummy and daddy will love you just as much as they do now when the new baby comes?” I said, still looking through the hole in the gate. What do I do now? I wondered. “Do you want your letter back?” I asked. “Yes please.” Sam came over to the fence, and I handed her the letter. I walked back to my place, shaking my head. Kid logic is weird.